Surpass Library Trek is now available for both Android and Apple iOS! Library Trek is free and avilable from the Apple App Store and Google Play. Library Trek puts your library in your patron's pockets. 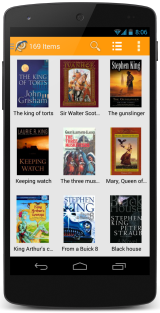 Your patrons can use their Android phone or tablet, iPhone, iPad, or iPod Touch to search your collection, read reviews, place holds, check their accounts, renew checked out items and even scan barcodes at stores to see whether a book they are considering is available at the library. If your library has Safari Web Edition (or Hosting Service) and your Surpass Support subscription is active, you and your patrons can start using Library Trek today! Just go to the Activate Library Trek page on SurpassSupport.com for a quick and easy setup. Library Trek server software is included in your Safari Web Edition and requires no additional software purchase. Your annual Surpass Support subscription will increase by a minimal amount ($25-$75) depending on your Surpass edition. If you do not have Safari Web Edition, contact us at 877-625-2657 or sales@SurpassSoftware.com for a special limited-time offer to upgrade to Web Edition. If your Surpass Support subscription has expired, you can renew online at SurpassSupport.com using the login credentials on the left side of this page. To help you spread the word to your patrons, we have created a sign for your circulation desk and bookmarks you can print. We have put together a list of common questions and answers on SurpassSupport.com. And, of course, we're standing by at Surpass Support to answer any questions you may have.